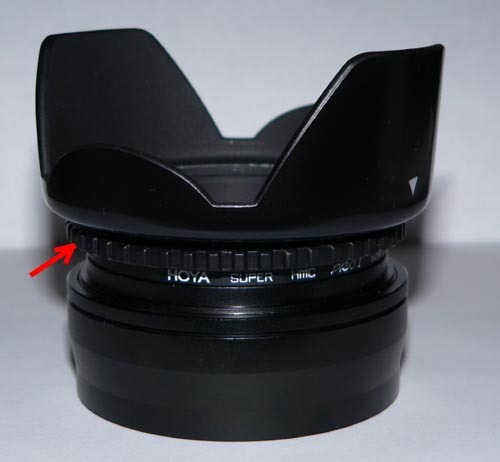 Does any body know if this lens hood fits the Permaraal PA-62 adapter? Don't know the answer, so I thought I might bump this. The FZ-1 comes with such a lens hood and it doesn't cause vignetting. (Surprisd the 15 doesn't, assumed it did...) Perhaps someone else can assist. Besides... no "goose eggs" in the reply column are allowed on this forum! As you will see in the photo, I have it screwed on to my 62mm filter. The only draw back is that it can make using a polarizer a little difficult. I have not noticed any vignetting on mine. This hood will neither vignette nor protect your lens. Pardon the pun but this is Chinese "junk". A petal hood is a compromise and this one is so shallow as to be very ineffective. If you want a decent hood, get a Hama rubber collapsible. I do not have enough experience with this camera or photography to comment on whether or not the hood functions properly. As far as build quality, it seems on par with the one suppliedfrom Panasonic. At least you don't have the thumb screw tightener on the side. The FZ3 comes with a lens hood and an adaptor to fit that on to the camera. The manual says "in bright sunlight or backlight, the lens hood will minimise lens flare and ghosting. The lens hood cuts off excess lighting and improves picture quality. "I have not used the lens hood yet. Let me first improve mypicture quality and then may be I will start using the hood! However, I have the adaptor always fitted, because itcovers the extended lens fully. The lens capfits the adaptor also, so closing the lens when not in useis not a problem. If hood has a 62mm thread then yeah you should be able to use iot with the PA62 without any problems. I doubt if it's gonna cause vigneting. I'd get a Hama or Hoya rubber zoom hood as well. The hood has a "lock ring" so to speak to allow it to be tightened in any position you like. I have drawn an arrow to it in the attached pic. I simply screw the hood until it starts to get tight and then back it off until it is positioned correctly. I then tighten the lock ring against the filter/adaptor until its just snug. I try to be careful not to overtighted these types of components. To answer your second question, yes the hood will turn with the polarizer if attached to it. Its not really a problem, you can use the hood to rotate the polarizer. I'm sure it limits the function of the hood itself, but then again, I'm not so sure lens flare is as big of a problem when using a polarizer. I am certainly not an expert in that area, but maybe one of the more advanced users here could comment. Looks like you fellows do not believe me after all 57 years in photography what do I know. Here is your class assignments. There will be a small quiz in the morning. A good hood is more important then a good filte!